Top: Rachel Serafin, The Florida Aquarium coral biologist, presents the Aquarium's coral reproduction success at the World Aquaculture Society Conference. Left: Staghorn coral from the August 2017 spawning. Right: Elkhorn coral from the August 2017 spawning. Credit all: The Florida Aquarium. 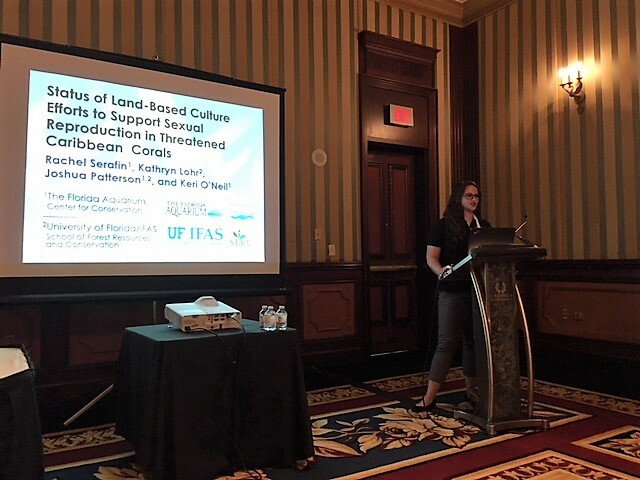 Rachel Serafin, a coral biologist at The Florida Aquarium, was a featured speaker at the World Aquaculture Society Conference held in Las Vegas from Feb. 19-22, 2018. The World Aquaculture Society is an organization recognized for its professional credibility in aquaculture science, technology and education. 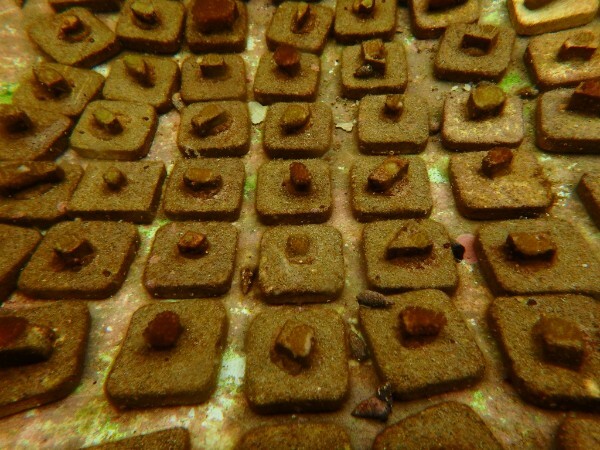 Serafin spoke about The Florida Aquarium’s unprecedented success in coral reproduction. This year has been the Aquarium’s most successful year to date in coral reproduction. 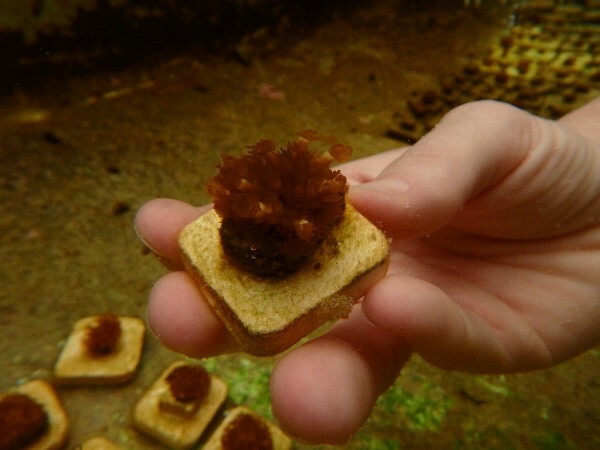 The Aquarium currently has 120 coral juveniles that have survived and flourished from last August’s spawning event (when corals release eggs and sperm in the water at the same time to reproduce). “Speaking at this conference, on a global stage, is a necessary step forward for coral restoration. Corals are not your typical cute, cuddly animal. They are often forgotten, but they are vital to the health of our oceans. Speaking at such a prestigious conference allows us to bring attention to this critical issue before it is too late and all our reefs are beyond repair,” said Serafin. Corals are the building blocks of marine habitats and oxygen-giving marine organisms, and though they cover only about one percent of the ocean floor, they have a huge effect on the health of the rest of the ocean and the planet. That is why The Florida Aquarium is working hard to protect and restore our oceans and raise awareness about the many threats coral reefs face today, such as increasing water temperature, pollution and overfishing. There are different types of coral aquaculture practices that The Florida Aquarium uses to aid in coral restoration, but genetic creation through sexual reproduction was the focus of Serafin’s presentation. The Florida Aquarium is a leading partner during the annual staghorn coral spawn in the Florida Keys. The annual coral spawn gives corals their only chance to sexually reproduce on their own and build future coral reefs, and this process is vital for scientists to witness for coral research and conservation. Every year, The Florida Aquarium and other partners dive 30 feet below the ocean’s surface in Tavernier Key, expertly collecting the spawn from the Coral Restoration Foundation’s coral nursery, and deliver them to teams aboard research boats. Those teams immediately begin the fertilization process using the bundles of eggs and sperm (gametes) and rush them to on-shore labs to maximize the development of embryos and ultimately free-swimming larvae. Some of the larvae were released to the wild, while others were brought back to grow at The Florida Aquarium’s Center for Conservation in Apollo Beach, FL and at other partner institutions.